Actor Russell Crowe’s 2000 historical drama film, “Gladiator,” is a favorite of Plant City resident Dean Snyder. Little did Snyder know that more than a decade later, messages portrayed in the film would carry even more meaning. 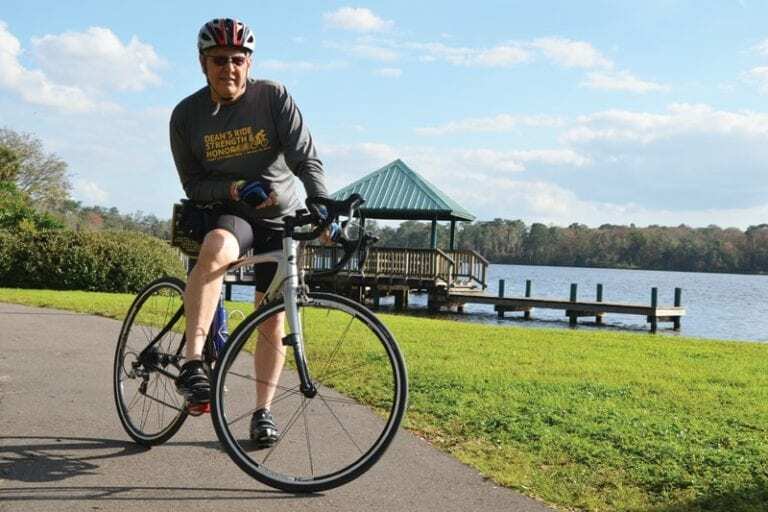 That movie inspired Snyder, both with his personal battle with cancer and with the formation of Dean’s Ride, a charity bike ride event benefiting the Plant City Family YMCA’s Livestrong program, a free wellness program for cancer survivors. The motto of the event is “Strength and Honor,” a saying Maximus, played by Crowe, tells Quintus before the battle with Germanian troops begins in the film. Snyder will never forget that day last September, when he sat down to eat a hamburger. After going to the doctor and enduring several tests, he was diagnosed with esophageal cancer. Although he has led an active lifestyle and always looked after his health — including not taking any medications other than allergy pills and over-the-counter medicines — cancer runs in Snyder’s family. When he was 21, Snyder’s father, Robert, died of lung cancer. His grandfather died from bone cancer in 1964. After serving in the U.S. Army for seven years and retiring in 1980, Snyder developed a love for running, but after knee surgery years later, he was left searching for something else to stay active. One of his two sons, Brandon, introduced him to road biking three years ago. “I needed something to keep me going and active,” he says. A member of the Plant City Family YMCA, Snyder already participated in cycling and spin classes, but he developed a love for road cycling. When he was diagnosed, Snyder used cycling as an outlet. After his father died, Snyder began volunteering with the American Cancer Society and serves on its board to this day. He thought of the idea of having a local charity ride a while back, but it never came to fruition. After his diagnosis, Snyder mentioned the idea to Cindy Gutowski, an employee of the Plant City Family YMCA, and the concept of Dean’s Ride was born. “We thought it would be a great thing to team up with the YMCA and raise money for the local Livestrong program here,” Snyder says. Livestrong is a 12-week program at the YMCA designed for adults who have recently become de-conditioned or chronically fatigued due to their treatment and/or disease. “It really is a great program and helps people deal and cope with having a critical illness,” Snyder says. Gutowski helped Snyder organize the ride, which will start and end at the Hillsborough Community College Plant City campus, beginning at 8 a.m. Saturday. According to Gutowski, in addition to benefiting Livestrong, this event also promotes cycling in the community. “This event is a ride, not a race, so it is intended for riders of all skill levels,” Gutowski says. To accomplish this, the event has two route options — an 18-mile and a 38-mile route. Stops will be provided throughout the routes for riders to hydrate or for anyone who may need help or medical assistance. Because both routes will begin at the same time and location, both novice and experienced cyclists alike will have the chance to mingle. “We hope this will increase the popularity of cycling here locally, (because) we’ll have plenty of first-time riders,” Gutowski says. Given the name, it’s only appropriate that Snyder participate in Dean’s Ride. Snyder plans to have his sixth chemotherapy session Friday, before taking to the 18-mile route the next day. He already rode the 38-mile route last weekend. “The cycle I’m on with chemo is working well for me, so if you postpone a week, it takes away from what you’re trying to accomplish,” he says about the timing. Typical effects from chemotherapy include fatigue, among other side effects, but Snyder says he won’t let that keep him from participating. According to Snyder, around 70 riders were registered as of Tuesday. He expects about 100 the day of the event. Contact Matt Mauney at mmauney@plantcityobserver.com. REGISTRATION: Online at tampaymca or active.com. Day-of registration may be made one hour before start time. SAFETY: All bike riders must wear helmets. Dean Snyder has called Plant City home for nearly 29 years and is a local business owner as the CEO of Snyder Investments and Financial Services. He belongs to the Tampa Bay State Planning Council on its board of directors as well as the National Association of Insurance and Financial Advisors. Locally, he is on the advisory board for the Plant City Photo Archives and History Center, the Arts Council of Plant City and assisted with the Veterans’ Memorial Monument Park project. He is also a past president of the Plant City Lions Club. Snyder also is an avid supporter of the Boy Scouts and has raised money for local chapters for the past 10 years.